Most men have great dreams but fail to achieve them because of one simple oversight. 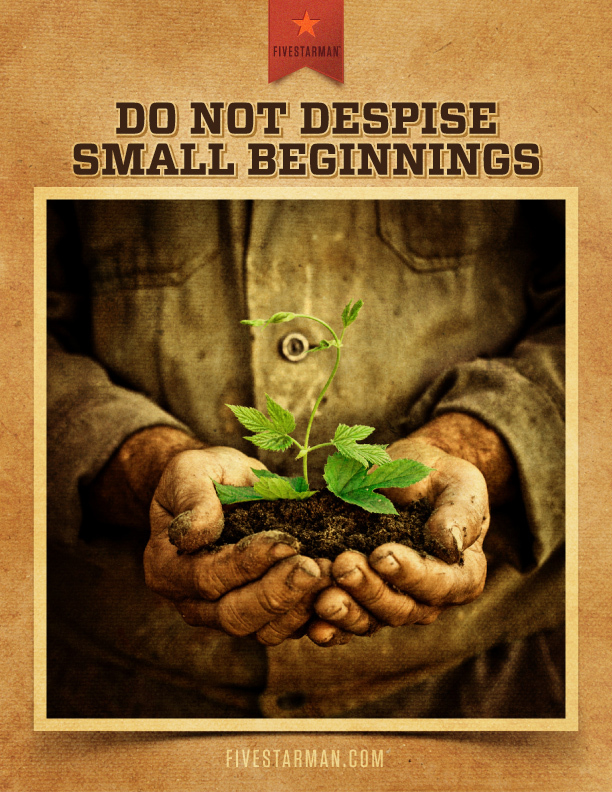 They despise small beginnings. You will never consistently attract increase in your life until you realize that it is in the small details of life where victory is won. David was chosen to become the king of Israel after the Holy Spirit rejected King Saul and each of David’s brothers. The Bible says that from the day that Samuel anointed David to be king, the Holy Spirit came upon David in power (I Samuel 16:13). Yet, what did David do after being anointed with the oil from Samuel’s flask? He returned to the pastures to care for his father’s sheep. One day, David arrived at the battle line of the Israelites and the Philistines with supplies for his brothers. He found the camp paralyzed by fear and in crisis. He overheard the threats of Goliath, the champion fighter from the Philistine camp. He also heard the promise King Saul offered for the man who would take out the champion—the promise of great wealth, complete tax exemption, and the king’s daughter in marriage. Disguised in this crisis was an opportunity. You see, even though David had received the anointing to be the next king of Israel, he was not in the natural lineage for the throne. He was not Saul’s natural son. But by killing the giant, David would step into his kingdom destiny. Marrying the king’s daughter gave David a place in the natural lineage of royalty. David’s brother Eliab, who had been rejected by the Prophet Samuel, accused David of failing to care for “those few sheep,” and then slandered him by calling David arrogant when he said he could kill the giant. David was not being arrogant, he simply was confident of victory. He had already proven himself faithful in the small things. David had protected his “few sheep” from a lion and a bear. The giant was just his next step. When you prove yourself faithful in small things, God promotes you to greater things—greater relationships, greater positions, greater rewards. God has confidence in you. Here’s another principle you can learn: As long as you despise where you are now, you will never leave there. Understand that the place where you are now is a temporary place. You are a nomad in the journey of ability. You don’t want to settle down and set up camp in one place. You must master your current position in order to go further in life.